Wynn Resorts recently announced that it has already spent over $75 million out of their $90-million budget buying properties surrounding the proposed Wynn Boston Harbor casino resort which has $2.4-billion budget. According to public records, the company has been targeting the area near the entrance of the casino, which includes various commercial and residential properties. A number of the properties that the operator had expressed interest in were already bought by Wynn Resorts’ 13 registered subsidiaries within Massachusetts. Wynn Resorts via its subsidiaries has successfully acquired properties on Lynde and Mystic streets. Wynn is still working to buy properties remaining in the already tapped areas, including a number of properties on Bow and Thorndike streets. Only a small portion of the $75 million spent is in finalized sales. The surrounding properties acquired by Wynn Resorts are not actually part of Wynn Boston Harbor itself. According to Wynn, it is only part of their effort to improve the whole neighborhood that will host the casino. It's property that we're buying so that we can turn Everett into a great example in America of how a business can change the neighborhood, and our hopes and our plans are to make Everett an entertainment and convention destination that completes and complements the one that exists already here. Wynn Boston Harbor has faced a number of challenges and delays in the past due to various license issues and lawsuits. One of the major concerns surrounding the project was that the construction of the integrated resort will have a negative impact on the environment and that traffic congestion will build up. This pushed Wynn Resorts to invest more on mitigating these perceived risks. 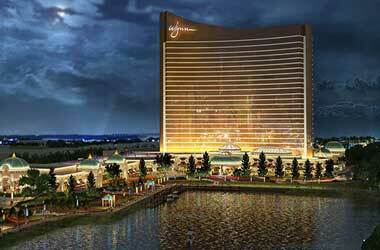 The construction of Wynn Boston Harbor officially commenced in 2014 when the Massachusetts Gaming Commission voted 3 to 1 to approve the proposed casino in Everett, Massachusetts. Spanning 33 acres of land, which was previously used for industrial purposes along the Mystic River, Wynn Boston Harbor is expected to become the largest private single-phase construction project in the state. When Wynn Boston Harbor opens in September 2019, it will offer multiple accommodation, various retail and entertainment hubs, food and beverage amenities, and a premium full-scale casino that is expected to attract gamblers from all over the country. Wynn Resorts have stated in the past that they expect the gaming part of the integrated resort project to bring in the highest revenue to the company and to the state of Massachusetts.